McDonald's Singapore has been pretty busy the last couple of weeks. In mid March they ran the first ever "All Day Breakfast" which at the time, I had intended on trying one of their new Breakfast Wraps on, but my wife and I forgot about it completely, even though it was heavily promoted. In addition to rolling out Whole Wheat McMuffin's and wraps (something I've longed for for a while) They've also launched the Surprise Alarm Clock, which gives you a new coupon every day by using it as an alarm clock on your Android or Apple device. Usually, I find apps like this to be a pretty big disappointment, but this one has been surprisingly good. Sure, on some days it's something pretty boring like a 'funny' image or a mp3 download, but I would say on 75% of days, you get a coupon for a free 'something'. We have it on maybe 5 different android devices at home, so we've been flooded with coupons. We've had coupons for anything from free McMuffins to free bacon. They are only valid for 24-48 hours, and some require a purchase to be redeemed (word is you can buy the 10 cent nugget sauce and still redeem the coupon). I haven't yet been able to redeem any of the better coupons like McMuffins or breakfast wraps, since a McDonald's isn't convenient on my trip into work, but I have taken advantage of a good number of free drinks, and various other snacks over the last 2 weeks. We even redeemed a free Small Fry coupon with our dinner tonight (we swapped out our regular combo fries for a cup of corn, so this allowed us to still get some fries). 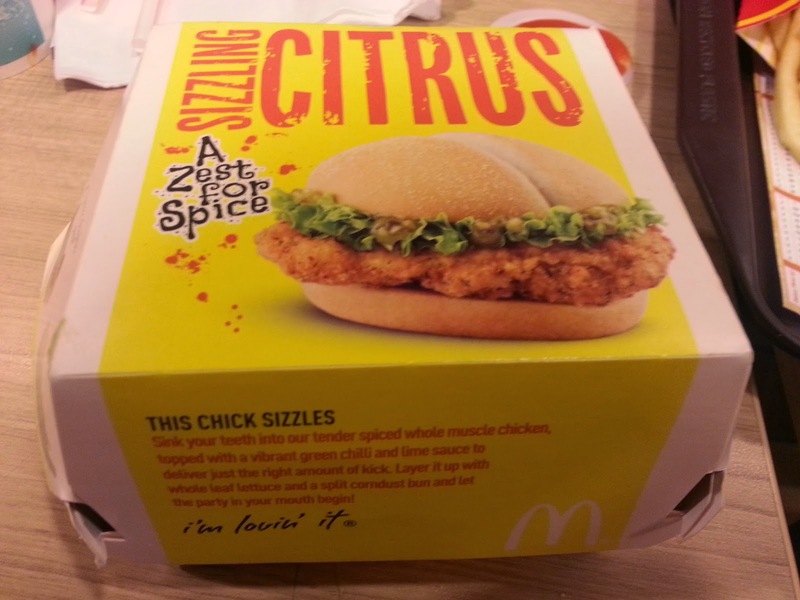 Even with all these promotions going on, a teaser was posted to the McDonald's Singapore Facebook page last Monday for the new "spicy challengers" that were to arrive on 3 April. They ran a similar promotion last year where the Red Peri Scorcher and the Black Pepper Flamer "battled" the standard menu McSpicy. Apparently both of the new burgers "lost" and they were discontinued, though this was never a big surprise, as it always seemed like there wasn't any chance they would be discontinuing the McSpicy. This year it's slightly different, where the eater is challenged to eat spicier burgers. 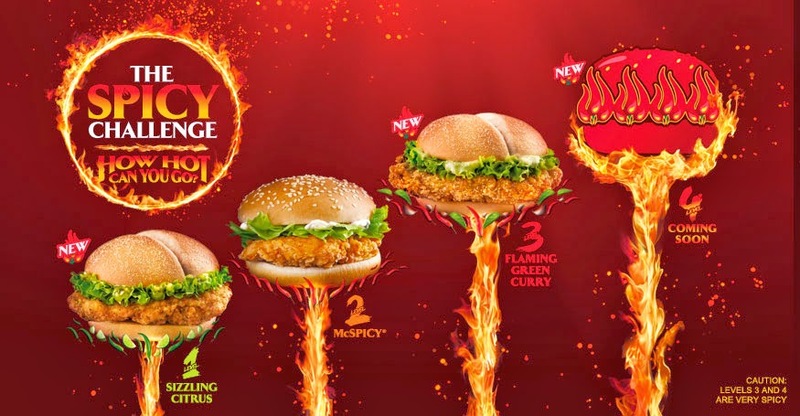 The new Sizzling Citrus burger is what they are considering Spicy Level #1, the standard McSpicy is Level #2, the new Green Curry Burger is Level #3, and a yet announced Level #4 burger. My wife opened the box for this burger, and she immediately passed it over to me saying "I am not going to like this", it did have a very strong scent to it, which she assumed was cilantro. I've mentioned the Korea-wide hatred of cilantro before and though we experience it more in Singapore (often) than we ever did in Korea (never), she still can't even stand the smell of it. I took a bite, and quickly told her that it wasn't cilantro, but rather a Thai-esc lime chilli sauce. It didn't smell totally of lime, so I could understand the confusion, but I probably would have figured it was a lemongrass smell before cilantro. Long time readers might ask if it was similar to the Citrus Thai McShakers, and although they are somewhat similar in name, luckily, this burger was actually palatable, unlike those disgusting shakers. It was nice to see that this wasn't just another spicy mayonnaise rehash, but a proper new sauce made specifically for this burger. 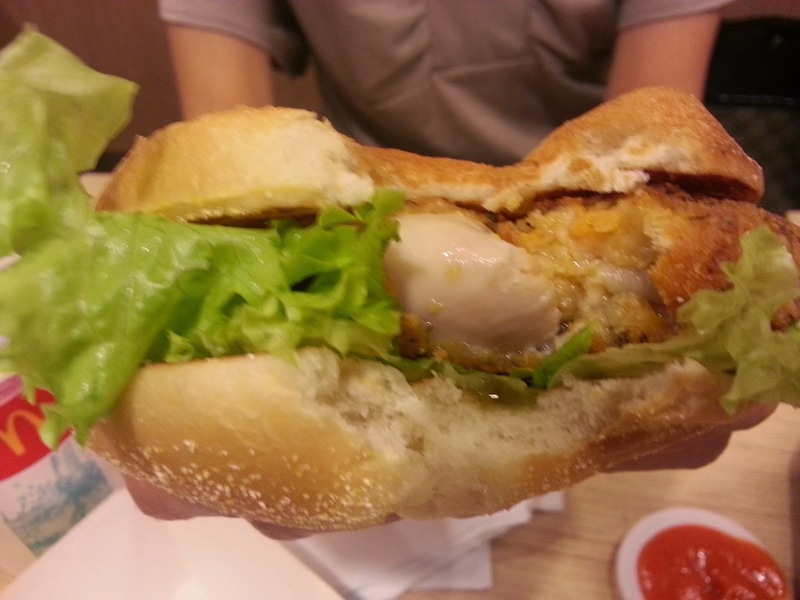 The chicken patty had the same thin batter as last years spicy promos, which I still enjoy more than the regular heavily battered McSpicy, they also must have taken my recommendation, as the patty was very thick (unlike the thin patties from last year), and still very juicy. 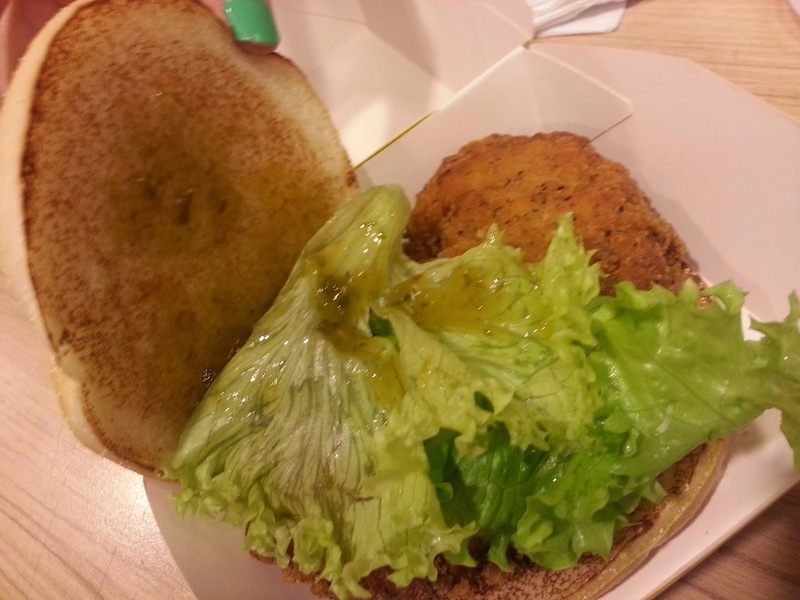 They continued to add seasoning in the actual patty, and they also used whole-leaf lettuce, which is always nicer than the finely chopped iceberg they used last year. My wife must have been put off by the smell, since although she took a bite or two, she said she didn't like it. 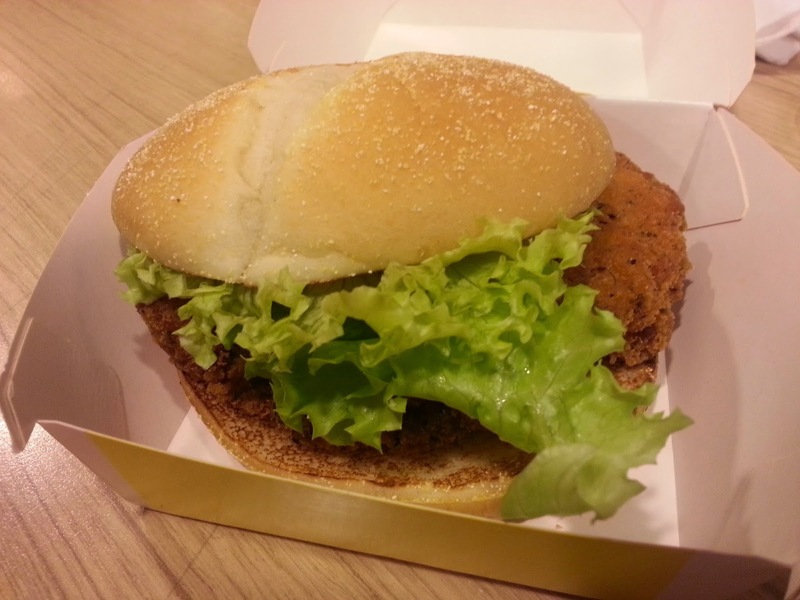 Personally, I thought this was one of the better promotional burgers McDonald's Singapore has had in a long time. 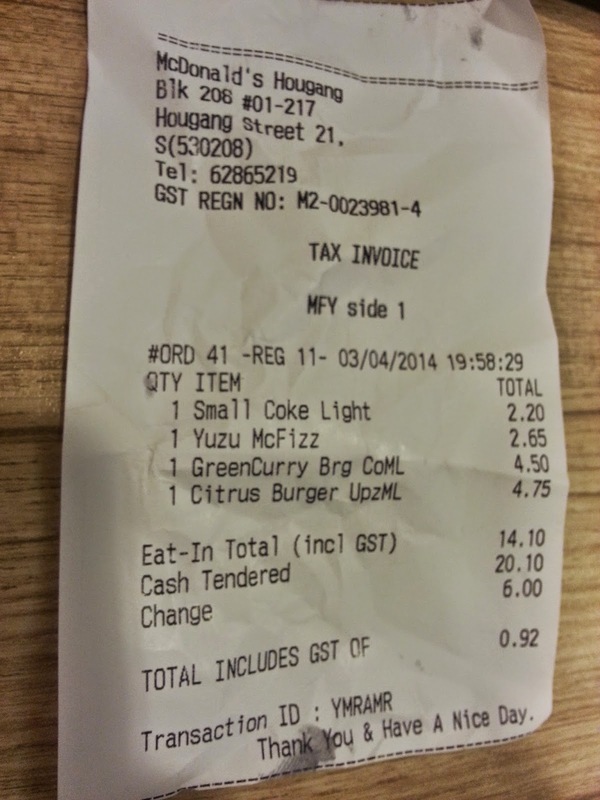 Although, it is becoming my common complaint about Singapore McDonald's, this yet again was not spicy AT ALL. But this time, I'll give it the benefit of the doubt since it was "Spicy Level 1"